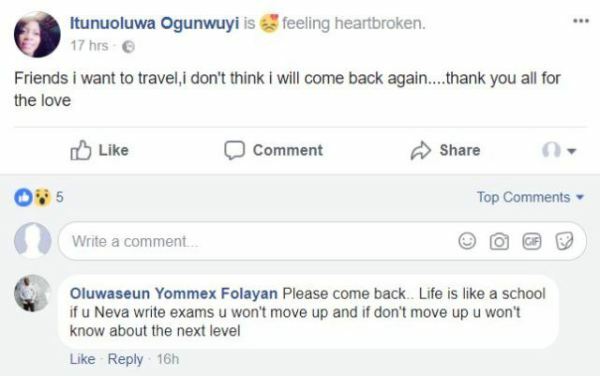 A Nigerian Lady with the Facebook Handle, Itunuoluwa Ogunwuyi has attempted suicide after her man broke up with her. Updates as regards her current state is currently unknown. “I don’t have other chouce than to cut it short. 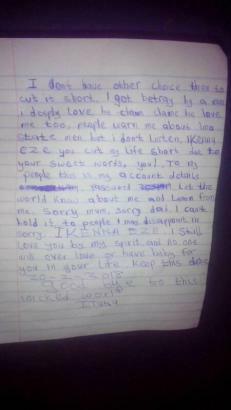 I got betrayed by a man I deeply love, he claim he loved me too, people warned me about Imo state men, but I didn’t listen, Kenny Eze you cut my life short due to your sweet words, YOU! To my people this is my account details ***** password ***. She doesn’t need to be berated but rather shown her d reasons why she shouldn’t take her own life. U ‘re beautiful, many good men ‘re out there waiting to be given an opportunity to be loved by u. Give life a second chance, prove to the guy that u will find a better man than him.